Compare your current hotel key figures – with no additional manual input and directly from your PMS – with the previous year’s, previous month’s or previous day’s values to determine growth rates. Identify best practices from your immediate hotel market environment and use them as benchmarks in your own strategy development to continuously expand your market share. With the guarantee of high data quality and fully compliant with the law, (Fairmas has an official declaration of tolerance), you can analyze your own performance data with the key figures or benchmarks of the hotel market at the push of a button. Choose from different comparison variables – throughout Germany or for your destination only, by hotel category or directly in comparison with your own individual competition set consisting of at least five hotel competitors. The Fairmas Event Report clearly presents important events and trade fairs, displayed by different levels of detail with just one click. This allows you to easily plan, analyze and document your hotel performance data in an event period. The additional Trend Barometer, the dynamic forecasting tool for more planning security, , provides you with valuable information about the expected developments over the next three months. You could also use these projected values as benchmarks to proactively decide on successful sales measures to take. Web-based access: accessible 365 days a year, 24 hours a day. Integrated Trend Barometer with a view of the development of the next three months that could also serve as benchmarks. The Trend Barometer reflects your own assessment compared to the assessment of the other participating hotels of the location. Hotel key figures or Key Performance Indicators (KPIs) are nowadays important control parameters for securing the long-term hotel success. They quantify performance to serve as benchmarks, help to recognize potentials, make Plan-Actual comparisons and visually illustrate variances. The quality of data, reliable and continuous data collection and processing, as well as the availability of important reference values are of crucial importance. Compare your own hotel performance figures with the average benchmark values of the overall market, your destination, your hotel category and with one of your defined competitor sets at the push of a button – it is completely flexible and without any additional effort. The choice is yours: The Fairmas Hotel Benchmarking Reports process data on daily, weekly, monthly or yearly basis. Since 2003, Fairmas has always ensured high data security through anonymization of all data and over the years, we have grown our client base to over 1,400 participating hotels and hostels. All benchmarking processes are carried out with the tolerance declaration from the German Federal Cartel Office. This makes Fairmas Benchmarking a reliable source of relevant hotel metrics and actionable information to ensure your sustainable hotel success in a highly dynamic market environment. In the hotel industry, it is crucial to regularly record and evaluate daily performance indicators in terms of occupancy of all available rooms, the average room rate and the average revenue per rented room. 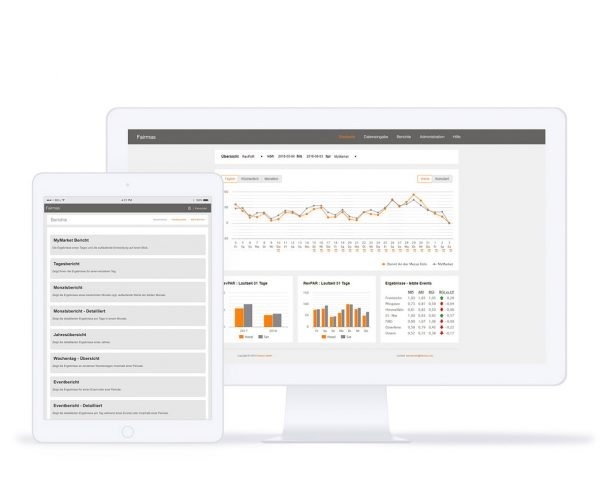 By comparing your actual Occupancy, Average Daily Rate (ADR) and Revenue Per Available Room (RevPAR) values with the planned target values of your budget planning, you will benefit from a real early warning system and important controlling tool for your hotel’s success. The value of information and significance of your benchmark analysis increase with the size of the database available to you. With this correlation, it naturally follows that the possibilities of differentiating the data and comparing them with each other in different time periods and segmentations increase as well. Fairmas Benchmarking further minimizes your effort by offering a variety of different preset benchmarking reports to choose from: Occupancy, ADR and RevPAR by destination, number of hotel stars, rooms, conference room availability, per room or bed. Alternatively, it also provides flexibility as you can also pre-define your own hotel competitor set and determine your position in your own hotel ranking based on percentage changes and other performance benchmarks or indices. Hardly any other market industry has become as dynamic as the hotel industry due to globalization and digitization. As a result, the customer booking behavior has changed significantly – customers book at shorter notice, use many different booking channels and are more price sensitive due to increased transparency. Nevertheless, a large number of influencing factors could be calculated through consistent benchmarking. For example, you could increase your planning accuracy by recording the measurable effects of trade fairs, congresses, holidays and public holidays on your occupancy via benchmarking, and take them into account in your planning process. The Fairmas Benchmarking Event Analysis feature is based on your destination and historical comparison data serving as benchmarks. It enables you to proactively consider your framework data and define appropriate strategies to maximize your hotel‘s success. The Fairmas Trend Barometer is a benchmark forecasting model that reflects the expectations of all participating hotels. The expected development in occupancy, average room price (ADR) and average revenue per rented room (RevPAR) for the next three months are shown here on a rolling basis. These are additional valuable information for fast, targeted action.